I was dreaming to visit Petra, in Jordan, since many years and finally I have realized my dream. Second site that I visited was the Mount Nebo is where Moses is said to have seen the Promised Land, a land he was himself forbidden to enter. It’s believed that he died aged 120 and was later buried in the area, although the exact location of the burial site is the subject of conjecture. The Mt Nebo region features several rocky outcrops, including Siyagha (the local name of the site, meaning ‘monastery’). The Moses Memorial Church is perched on the summit, commanding sweeping views of the Dead Sea and Israel and the Palestinian Territories beyond. A pleasant side trip from Madaba, just 9km away, the church with its magnificent mosaics is the centrepiece of a small hilltop complex, signposted from the Madaba–Dead Sea road. Third site was Qal’at ash-Shawbak: Shawbak Castle, possesses a Crusader church and a chapel as well as substantial secular buildings constructed out of stone taken from a nearby antique site and from quarries located one kilometre to the west of the castle. Numerous Arabic inscriptions in naskhi script record the various reconstructions of the castle. The impressive rusticated towers; curtain walls and a glacis (a paved slope) wrapped around the castle are fine examples of early Mamluk fortification showing the evolution of siege defences. In the evening, I arrived at Petra and the next day I visited it. 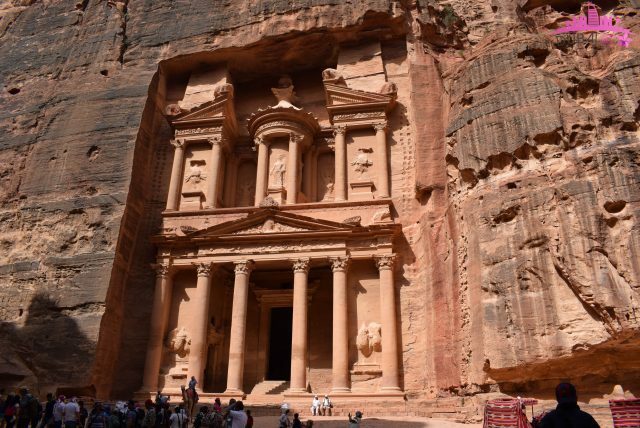 One of 7 Wonders – The “Treasury” at Petra. I was not surprised that Petra was announced as one of the new Seven Wonders of the World (on July 7, 2007) and has become the perfect and best tourist destination for many leaders and celebrities around the world: it’s just astonishing!! Petra represents a central convergence of the old trading roads between the Arabian Peninsula, Levant, China and Europe. Even if, the weather was warm, I was so excited to discover The Treasure of Petra, that the fatigue to walk in The Siq (the main road that lies between the city’s rose colored mountains, where it was shooted “Indiana Jones Movie”), disappeared when I arrived in front of it. The sight of the Treasury just amazed me: it represents the masterpiece of the ancient city with a height of up to 45m and width of 30m, all of which is carved into the mountain. It is called the Treasury, because the local bedouin mistakenly believed that there was treasure hidden somewhere inside. It is Located 240 km south of the capital Amman and 120 km north of the red sea town of Aqaba. It is not known precisely when Petra was built, but the city began to prosper as the capital of the Nabataean Empire from the 1st century BC, which grew rich through trade in frankincense, myrrh, and spices. Petra was later annexed to the Roman Empire and continued to thrive until a large earthquake in 363 AD destroyed much of the city in the 4th century AD. The earthquake combined with changes in trade routes, eventually led to the downfall of the city which was ultimately abandoned. By the middle of the 7th century Petra appears to have been largely deserted and it was then lost to all except local Bedouin from the area. The Nabataeans buried their dead in intricate tombs that were cut out of the mountain sides and the city also had temples, a theater, and following the Roman annexation and later the Byzantine influence, a colonnaded street and churches. In addition to the magnificent remains of the Nabataean city, human settlement and land use for over 10,000 years can be traced in Petra, where great natural, cultural, archaeological and geological features merge. Petra is also known as the rose-red city, a name it gets from the wonderful color of the rock from which many of the city’s structures were carved. From the way back, if you are tired, you can ride an horse and add another experience to your trip. It’s definitely a place you should visit before you die!! The next two days, I was relaxing in a resort in the Dead Sea.